The Wisconsin Technology council has booked Startup Communities Author/Guru, Foundry Founder, and Techstars Co-Founder Brad Feld to kick off their “early stage symposium” event on November 5th in Madison. Feld will be speaking to the group of entrepreneurs and innovators via telepresence at 8:30am the morning of Tuesday November 5th. As an added bonus all of the attendees to the early morning kick off lecture will also receive a copy of Feld’s book Startup Communities, which serves as the unofficial bible to building and strengthening your startup community/ecosystem. Feld has been an early stage investor and entrepreneur since 1987. Prior to co-founding Foundry Group, he helped start Mobius Venture Capital and previously co-founded Intensity Ventures. Feld’s role in TechStars began in Boulder and has since spread to six other locations while helping to spark the growth of tech business accelerators nationally. In addition to his investing efforts, Feld has been active with several non-profit organizations and is chair of the National Center for Women & Information Technology, co-chair of Startup Colorado, and on the board of UP Global. Feld writes the widely read blogs Feld Thoughts, Startup Revolution, and Ask the VC. “We’re excited to have Brad Feld address this year’s symposium and to help set the tone for a continued conversation about Wisconsin’s evolving startup scene,” said Tom Still, president of the Wisconsin Technology Council, which produces the two-day conference. • Presentations by more than 20 companies selected for the Wisconsin Angel Network investors’ track. Investors from across Wisconsin and beyond will attend. • The annual Elevator Pitch Olympics, which provide 90-second presentation opportunities for 15 or more additional companies. A panel of investors will judge the contest. • More than a dozen panel discussions or plenary sessions featuring leading entrepreneurs, investors and others tied to the tech sector. • “Office hours,” offering the opportunity to meet with subject experts on a variety of topics in small discussion groups or one-on-one. • SBIR/STTR awards luncheon to recognize grant recipients from the past year. • The annual “First Look” forum featuring selected campus-based technologies. • Exhibit hall showcasing more than 40 Wisconsin companies. • A first-night reception, two luncheons, two breakfasts and other networking opportunities, including an investors-only dinner. 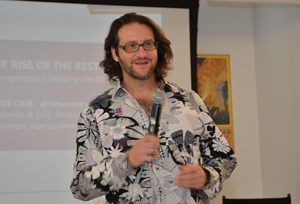 More on Brad Feld can be found here. BetterWalk Leaves Memphis After Accelerator For “Greener Pastures” In Atlanta?